42mm 18K Everose gold case, bidirectional rotatable ring command bezel, chocolate sunray dial, automatic Rolex caliber 9001 movement, second time-zone displayed via off-center rotating disc, Saros annual calendar with date at 3 o'clock and month indicated in discrete apertures at each of the 12 hour marks, brown alligator leather strap with 18K Everose gold folding Oysterclasp. Water resistant to 100 meters. 42mm 18K Everose gold case, screw-down back, screw-down crown, fluted bezel with bidirectional rotatable Rolex Ring Command, scratch-resistant sapphire crystal with cyclops lens over the date and double anti-reflective coating, dark rhodium dial, index hour markers with Chromalight, Rolex calibre 9001 automatic movement , second time-zone displayed via off-center rotating disc, Saros annual calendar with date at 3 o'clock and month indicated in discrete apertures at each of the 12 hour marks, brown leather strap, folding Oysterclasp buckle. Waterproof to 100 meters. 42mm 18K Everose gold case, screw-down back, screw-down crown, fluted bezel with bidirectional rotatable Rolex Ring Command, scratch-resistant sapphire crystal with cyclops lens over the date and double anti-reflective coating, sundust dial, Roman numerals, Rolex calibre 9001 automatic movement , second time-zone displayed via off-center rotating disc, Saros annual calendar with date at 3 o'clock and month indicated in discrete apertures at each of the 12 hour marks, brown leather strap, folding Oysterclasp buckle. Waterproof to 100 meters. 42mm 18K Everose gold case, screw-down back, screw-down crown, fluted bezel with bidirectional rotatable Rolex Ring Command, scratch-resistant sapphire crystal with cyclops lens over the date and double anti-reflective coating, white dial, index hour markers with Chromalight, Rolex calibre 9001 automatic movement , second time-zone displayed via off-center rotating disc, Saros annual calendar with date at 3 o'clock and month indicated in discrete apertures at each of the 12 hour marks, brown leather strap, folding Oysterclasp buckle. Waterproof to 100 meters. 42mm 18K Everose gold case, bidirectional rotatable ring command bezel, chocolate sunray dial, automatic Rolex caliber 9001 movement, second time-zone displayed via off-center rotating disc, Saros annual calendar with date at 3 o'clock and month indicated in discrete apertures at each of the 12 hour marks, 18K Everose gold Oyster bracelet with Oysterclasp and Easylink extension link. Water resistant to 100 meters. 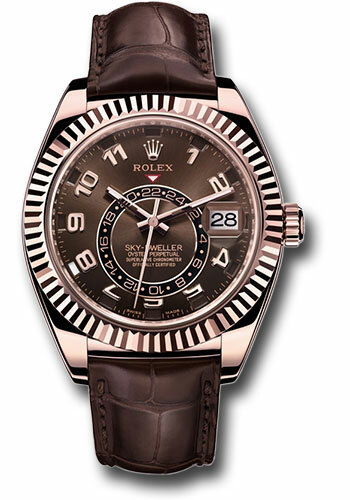 42mm 18K Everose gold case, screw-down back, screw-down crown, fluted bezel with bidirectional rotatable Rolex Ring Command, scratch-resistant sapphire crystal with cyclops lens over the date and double anti-reflective coating, dark rhodium dial, index hour markers with Chromalight, Rolex calibre 9001 automatic movement , second time-zone displayed via off-center rotating disc, Saros annual calendar with date at 3 o'clock and month indicated in discrete apertures at each of the 12 hour marks, Oyster bracelet with flat three-piece links, folding Oysterclasp buckle. Waterproof to 100 meters. 42mm 18K Everose gold case, bidirectional rotatable ring command bezel, sundust sunray dial, automatic Rolex caliber 9001 movement, second time-zone displayed via off-center rotating disc, Saros annual calendar with date at 3 o'clock and month indicated in discrete apertures at each of the 12 hour marks, 18K Everose gold Oyster bracelet with Oysterclasp and Easylink extension link. Water resistant to 100 meters. 42mm 18K Everose gold case, screw-down back, screw-down crown, fluted bezel with bidirectional rotatable Rolex Ring Command, scratch-resistant sapphire crystal with cyclops lens over the date and double anti-reflective coating, white dial, index hour markers with Chromalight, Rolex calibre 9001 automatic movement , second time-zone displayed via off-center rotating disc, Saros annual calendar with date at 3 o'clock and month indicated in discrete apertures at each of the 12 hour marks, Oyster bracelet with flat three-piece links, folding Oysterclasp buckle. Waterproof to 100 meters.